With all of the different electric skateboards on the market, it can be difficult to find the right one for you. We love researching all of the reviews we come across in order to find the best electric boards around. There are all kinds of unique and impressive additions being made to electric longboards and skateboards, and we always try to stay on top of things. When we first came across the Riptide Electric Longboard, we knew it would be a huge hit. Riptide has been known to produce high-quality and entertaining products in the action sports industry. Once we caught a glimpse of the Riptide long, we weren’t surprised at all by how incredibly energy-efficient and quick it went. These attributes always come with a Riptide product! What did surprise us was how compact it was, and how smoothly it rides. Most electric skateboards are a little bit longer and wider than a regular skateboard. They have to fit a bulky battery underneath, which requires a little bit more room. However, the Riptide electric board remains thin and just as short as a regular skateboard. We were worried at first that it might affect the battery’s longevity, but rest assured, the battery is incredible! Instead of leaving you with all these little teasers about the Riptide Electric Skateboard, we did all of the research we could and compiled it into this article. If you want to know all about the impressive features and energy-efficiency packed into this board, then read on! Like this? We think you’ll love the M1 electronic skateboard. One of the first things we usually like to talk about with these electric boards is the motor and the battery. If your board doesn’t have a good battery or motor, then you’re in for a huge disappointment. After all, what’s a fancy electric skateboard if it only lasts a mile? Believe it or not, they used to all have issues like that. Or they wouldn’t go past 8 miles an hour, one of the two. However, the impressive motor on the Riptide Electric Skateboard gets the board up to 18 miles per hour! Obviously, it’s a much better turn out that the original boards that were being produced. There’s not much of a need to go any faster than 18 miles per hour, so we’re pretty content with the quality of this motor. The battery on the Riptide Electric board is also pretty outstanding. It can carry you up to 7 miles per charge, which is more than you need to get around town. Not only that, but the quick charger gets the job done in less than 2 hours. Not many modern chargers can do that, even with all the advancements made in the industry, like the Maxfind board we reviewed. You’ll need a wireless remote in order to pilot the Riptide Electric Skateboard. Don’t worry though, it comes with a pretty slick ergonomic remote that fits perfectly in your hand. Stop carrying around a brick-like remote and get ready for ultimate comfort while riding on one of these boards. Your investment should always include comfort, and this one does. The wireless remote for this board features 3 different modes. There’s a beginner mode that takes it slow and teaches you the ropes. Nobody expects you to be an expert immediately! The next mode is eco-friendly and helps your battery life last a lot longer by reducing maximum speed and acceleration. The final mode is full-force. The 1800 watt releases its full power and lets you take the reins. This isn’t for the beginner, of course! Once you’re all prepared and trained up, mode 3 is sure to impress! What’s great about this remote (other than the 3 modes) is the fact that it charges up super quickly and it’s meant for the user. What we mean by this is that it’s ergonomic, has 3 modes for you specifically, and it’s quick-reacting which is very important when going at higher speeds, especially when you aren’t familiar with it yet! While it’s not uncommon to see helpful remotes, powerful motors, or long-lasting batteries, what is rare is a board made for the user. It seems crazy to think that all of these electric skateboards being produced don’t think about one of the main things that people like to do one skateboard: Tricks! Skateboarders love doing tricks obviously, which is why the Riptide Electric Skateboard has a special curve at the end of it. The curve at the end of the board helps your foot positioning when jumping up onto the sidewalk as well as giving an elevation boost to other tricks. Another cool feature that’s made for the rider is the two handles positioned on both sides of the board. These handles help you pick up the board with ease, which makes walking around while carrying it a whole lot simpler. + Ergonomic wireless remote that helps you guide yourself along with ease. With 3 modes to choose from, you’ll have no problem getting used to the Riptide board at your own pace. You can also stay energy-efficient and get a longer battery life with the eco-mode. + The powerful 1800 watt motor is bigger than most other electric boards that we’ve seen! It can bring you up to 18 miles per hour, which is also very impressive. Uphill, downhill, tricks, nothing is a problem for this motor. + This electric board is made with the user in mind. With a handle on either side and a slight curve at the end, you can do all the tricks you want and then carry it away when you’re ready to call it a day. + The compact design of the Riptide board is an awesome feature because it’s so much easier to bring with you. Even riding it is easier for most people because it’s the same familiar shape and size of a normal skateboard. – 7 miles is definitely not the greatest performance out of a battery when compared to some of the other brands. However, you can buy a separate battery for the Riptide, which brings you up to 14 miles! – For some users, getting used to a compact board might be difficult. Although it’s the same size as a regular skateboard, some people find it harder to use because a wider stance is generally easier with a faster speed that comes with these electric boards. The Riptide Electric Skateboard is suitable for anyone looking to cruise around at a much quicker pace. It’s always fun to ride an electric skateboard, and the 3 settings on the remote make it super easy to learn. These boards are also great for an alternative method of transportation. Not only do you get around much faster, but it’s also much better for the environment. With so many people driving cars and putting gas pollution into the atmosphere, having a few people ride electric vehicles can make a serious dent in a major issue that so many ignore. If you’re trying to find a better way to travel around town to make a better impact on the world by reducing your carbon footprint, then electric skateboards are the way to go! Having an electric board that gets up to 18 miles per hour is awesome. It’s all about having fun while being efficient with energy and getting to places you need to be. This isn’t some light-up music-playing fancy toy, it’s all about business. However, business needs a little bit of fun sometimes, which is why having the tilt on the end of the deck to practice some cool tricks is an awesome additional feature. The little extra features like the ergonomic wireless remote and the super dense and wide tires are just additional points that make the Riptide an even better deal in our eyes. You don’t want to burn down your tires too fast, which is totally possible when you’re going as fast as these boards will take you. Luckily, the Riptide board has wheels made specifically for this type of constant wear and tear, so you’re all covered. If you’re looking for the next step up from the Riptide, the Boosted 2nd Gen Dual+ Standard Range Electric Skateboard boasts a few features that make it one of the most sought-after electric skateboards on the market. For starters, it boasts a 22 mile per hour speed limit, which is 4 higher than that of the Riptide. It also has a 2000 watt motor, which is 200 watts more than the Riptide. We love both the Riptide and the Boosted 2nd Gen Dual+ Standard Range Electric Skateboard. Both of them have pros over the other. For instance, the Riptide electric skateboard has a much more compact design, which a lot of riders prefer, as well as an ergonomic remote. 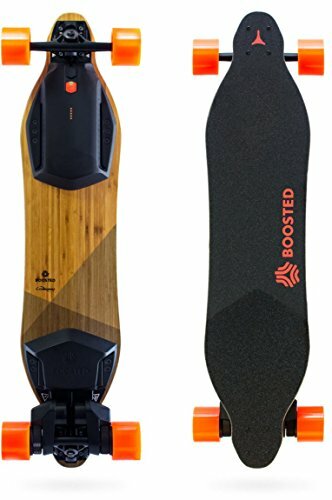 The Boosted 2nd Gen board has a higher speed and a longer lasting battery. Both of them are great boards, and it’s up for you to decide which has the better pros for your situation!